This series is dedicated to the runners from the Kettle Moraine Lutheran HS cross country team who have made it to the WIAA State Meet held at the end of October each year in Wisconsin Rapids. These boxes are placed in Nepco Lake County Park which is located just a couple of blocks west of the country club where the state meet is run. As more runners qualify, this series will expand. The boxes are located along the cross country ski trail in the park which has a fee during the winter if you are skiing. These boxes are best to find during the non-winter, but if you look in the winter and are not skiing, please do not walk on the actual ski lines cut into the snow, rather walk off to the side of them. Also, the park does have restricted hours during winter (Nov. to May), so be sure to go when there is plenty of sunlight. Thanks! Patrick was the first runner from KML to qualify for the WIAA state meet. (Before this, KML participated in the WISAA meet in which everyone participated.) 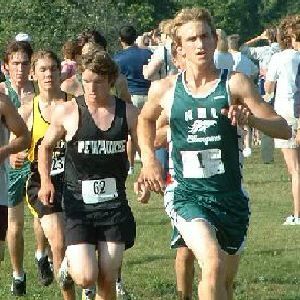 In 2004, at the Mayville Sectionals, Patrick ran a 17:16 in the rain to earn his spot in KML CC State history. Patrick's trip to state inspired his teammates. 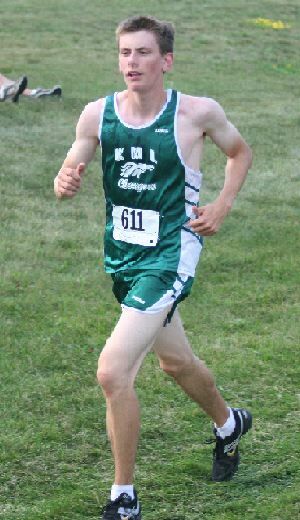 The very next year, Eric Seer accomplished his season goal and qualified for state at the 2005 Mayville Sectional placing 11th with a time of 17:26 - only a few seconds ahead of his teammate and friend David Matter. David helped Eric throughout the season to overcome various difficulties, culminating in his pacing Eric to the state finals at Mayville. Unfortunately for David, Eric was the last individual to qualify from the Mayville meet, otherwise the two would have gone to state together. From Patrick's box, continue on the path past the green bench. Follow the path for quite a while as it twists and turns. Eventually you will come upon a left bend in the trail with a CC skiing sign on the right. Looking over, you'll notice this is where the park road forms a "Y". From the CC skiing sign take 25 more steps. Stop and look to the left (north) for a blue sign in the woods. Walk over to this sign, then go a couple more steps past it. On the ground you should find some fallen branches. Where they form an "X" is the spot! In 2007, freshman Tabby Thorson quickly made her mark on the Kettle CC team. By mid-season, she broke the school record by over 40 seconds. She ended up breaking 16 minutes twice and set the five fastest times in school history. She ended the season by qualifying for state as an individual at the sectional meet, competing against some of the top runners in the state. From Eric's box, continue on the trail. The trail will bend left, and then bend left again. Shortly after this bend you should be able to spot a large fallen tree along the left side of the trail. (There is a bare stump of a tree leaning at an angle on the right side of the trail here too.) Go to the other side of this fallen tree and follow another fallen tree deeper back into the woods where there is a clearing with a mossy stump (about 22 steps). Find the pair of fallen trees to the north of the stump. Walk 8 steps along these fallen trees, and you should find the box under leaves and bark under the smaller fallen tree that is parallel to the larger fallen tree. In 2008, Tabby led the girls team to state! It will take me a while to carve seven new stamps from photos, but watch for these to show up by next November!